Holster Engineering has modern precision machine shops with over 3000sq metres of covered floor space and well established back up facilities with a lifting capability up to 32 tonnes. 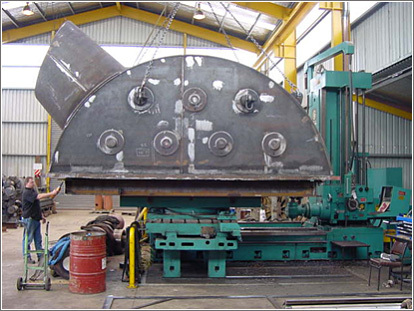 The in house fabrication facilities are suitable for all types of repairs – maintenance and manufacture. Dynamic balancing of units up to 4 tonnes and on-site balancing is available. The facilities include normal stock of fabricating steel of approximately 100 tonnes, including mild steel plate up to 100mm thickness. The stock includes 30 tonnes of shafting, both high tensile and mild steel up to 250mm thickness. Additionally Holster Engineering Co. (2003) Ltd has an associate company HOLSTER SUPPLY Co. (2003) LTD, a member of the TradeZone Industrial Group, which has a comprehensive range of engineering consumables in stock at all times.